I’m Zoe Edge; born in 1974 with Cerebral Palsy. I live with my parents and my dog Lester. He is my baby. Mum and dad are the best parents anyone could wish for. They’re my friends as well as the people that brought me into this world. I also have 6 godchildren that I adore. I’ve competed in sport since I was 8 years old. I had a very successful sports career for 20 years. I represented my country in many International competitions. The highlight of my career was winning a Bronze World Championship Medal and a Paralympic Silver Medal. I like doing everything and anything I can! I go on as many holidays as possible. 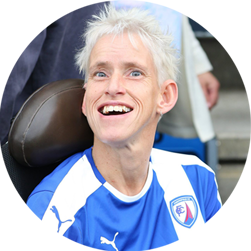 I’m Chesterfield FC’s number 1 fan and I go to almost every match. I love my food. I like to shop a lot. I like most music, mainly 80s/90s pop, 50s/60s/70s rock and roll, swing and jazz. My favourite films are “Grease” and “Dirty Dancing”. My favourite musicals are “Oliver” and Dreamboats and Petticoats”. I like anything to do with Harry Potter, Charles Dickens and Beatrix Potter. I like having a laugh, having fun and I don’t like taking life too seriously – least not if I can help it. I like feeling happy and I do the best I can to make people feel happy. I’m a sensitive, very loving caring person and a loyal, real & true friend. I’m wild on the outside, but quite sensible and reasonable really. I have a lot of respect for my parents, family and friends. I have a wicked sense of humour; I’m very honest and truthful. I love living life!